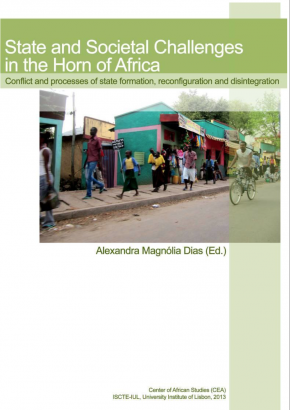 This book brings to fruition the research done dring the CEA-ISCTE project ‘’Monitoring Conflicts in the Horn of Africa’’, reference PTDC/AFR/100460/2008. The Portuguese Foundation for Science and Technology (FCT) provided funding for this project. The chapters are based on first-hand data collected through fieldwork in the region’s countries between 4 January 2010 and 3 June 2013. The project’s team members and consultants debated their final research findings in a one-day Conference at ISCTE-IUL on 29 April 2013. The following authors contributed to the project’s final publication: Alexandra M. Dias, Alexandre de Sousa Carvalho, Aleksi Ylönen, Ana Elisa Cascão, Elsa González Aimé, Manuel João Ramos, Patrick Ferras, Pedro Barge Cunha and Ricardo Real P. Sousa. International intervention and engagement in Somalia (2006-2013): yet another external state reconstruction project?